PSST: What is your painting setup while using pastels, and has your work in other media affected how you plan and execute a pastel painting? NELL BEDNARZ: Oils allowed me to work very fine and thin in glazes, and I loved the luminosity of working that way. Painting underpaintings for my pastels on Ampersand Pastelbord, I work more the way I was taught with watercolor and acrylics on paper. I prefer painting on white Pastelbord, setting a unifying tone overall or the shadow shading in the first layer, as a water and pastel wash, massing in the values. I also have been excited to wash in the complement colors of my subject, using the visual mixtures of the pastel pigments to neutralize the final layers a bit. These days, I do field work and take photos that then are used as reference for my studio paintings. On rare occasions, I do plein air, but my sensitivity to UV and heat has made it difficult to stay at a plein air sitting for very long. I have a purpose built fine art studio in Weston Lakes, filled with northeast light, and once I get in that room, it is hard to leave. My references, framing table, and work spaces are all there, and I have an attached bath for access to water and ventilation. 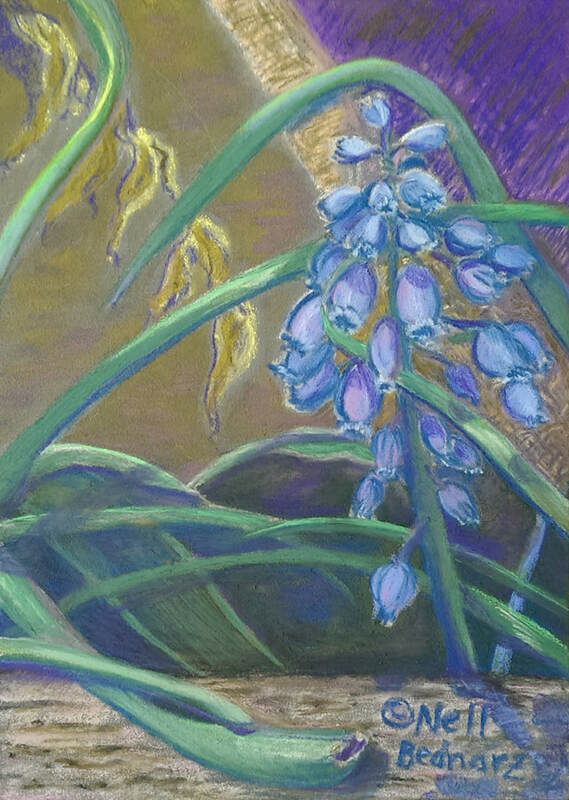 Pan Pastels are current favorites for laying in backgrounds for landscapes, still-life, and pet or floral portraits. 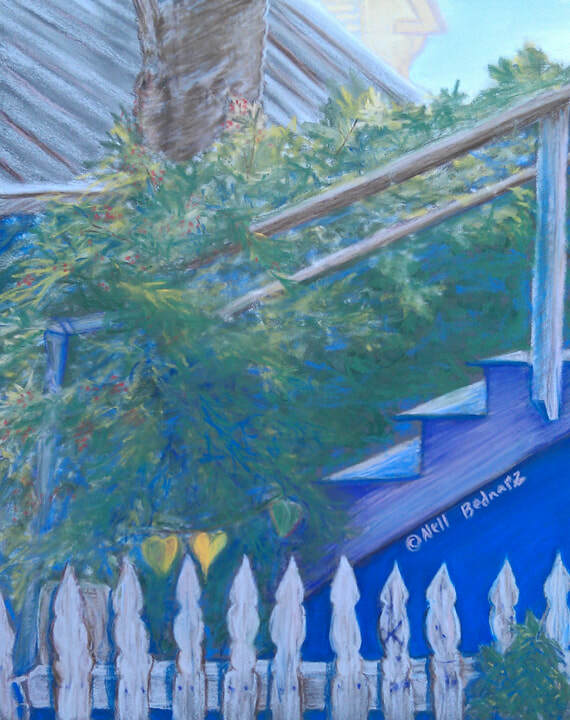 My art depends upon several brands of pastel pencils, including Derwent, CarbOthello, Bruynzeel, Conte’, Stabilo and Cretacolor of Austria, and I prefer an emphasis of line in my paintings. The majority of my painting strokes are from Rembrandt and Unison half-sticks, with a touch of Sennelier or Terry Ludwig as soft final touches, as well as using Pan Pastels again as needed. PSST: Have you always seen yourself as an artist? ​NELL BEDNARZ: I think that God created me for His purposes as an artist, but it took a while for me to find that role. As a young farm girl, I struggled with learning to read due to a sequencing problem, but my memory has always been strongly visual. I never thought of myself as anything but a farmer, when I was young. However, in 5th grade I was blessed to be involved with Picture Memory (Interscholastic League competition), and it became a fascination to remember masterworks of fine art. My mom, Wilma Garnett (O’Briant) Little, shared with me about her art studies in college at Texas Tech, and she put fine art prints in our home by famous painters like Van Gogh, Gauguin, Bruegel the Elder, and Vermeer. I still have that Vermeer (The Lace Maker) in my home as a reminder of such influences. I began making art in 7th grade, about 1968-69, while taking art class at Abernathy Junior High. Drawing took a leap forward, from stick figures to actual sketches and drawings, when my art teacher taught me how to “see” with my right brain. One 45-minute class, and I was hooked for life. Drawing was my art form-- 2B pencil on paper -- as a school student, and I loved drawing trees. Out in the arid High Plains of Texas north of Lubbock, we had two seasons -- the dead-brown-and-dusty season with no living crops and the vivid growing season when our cotton and grain fields and the local native pastures glowed with health. So my early work, and even what I create now, was sort of polarized into color and monochrome, including paintings, drawings, fine art jewelry designs, assemblage, and scratchboard monochrome work. I started painting in oils as a high school teenager, using my mom’s oil paints. Both my parents encouraged us to learn photography, sending us out into the fields to record the success of herbicides on the cotton fields. For a hoe-hand to get a break from back-breaking labor to do something creative, this was a pivotal moment in my life. So I painted in oils from about 1973 until my young children came on the scene in 1985, and I later returned to oils after about 2000, only rarely. That was because while living overseas and working in dry media, I fell in love with pastels and using acrylics on canvas. Both are very versatile media. ​PSST: You describe yourself as an international artist. Please tell us what led to your being involved in art events overseas, and how has this experience changed your work? NELL BEDNARZ: My farm work experience and art training actually helped me become a Plant and Soil Scientist with an emphasis in crops, so drawings were mainly scientific studies for many years. My oil paintings in those years were purely for pleasure, but I put a landscape or two in a gallery in Lubbock for a few months after college graduation. I worked as a soil and water conservationist nearby. I married my husband Mike, moving to the Dallas area, and continued conservation work for just over a year. When health issues began to take a toll on me, I resigned from working with the USDA. I did a summer job working in Texas native plant selection with Mr. Benny Simpson at the Texas A&M Experiment Station in Renner, Texas, in 1984, and I have studied native flora and fauna ever since. The blessing of having our two daughters set me on a new path, and I dropped out of agronomic work to learn new ways of thinking for illustration and writing children’s books, as well as studying new ways of making art. We moved overseas in 1988, and I primarily studied natural history of the areas we lived in, as well as taking up drawing in various media. Friends in the Women in Abu Dhabi (WIAD) group introduced me to pastels. The quest for proficiency continues even to this day. My international artist designation really began in Abu Dhabi, United Arab Emirates in the 1990s, culminating in my small pastel drawing of an Arabian Leopard cub being part of a special art exhibition to help raise funds for the Arabian Leopard Trust, for which I was an early member. I enjoyed a few opportunities for giving education programs to the schools, as well as working with the Emirates News editor Peter Hellyer, writing about natural resource conservation for the Green Spot, his weekly environmental/nature feature. While overseas, I wrote for regional magazines in the Middle East and in South America about nature and the arts. 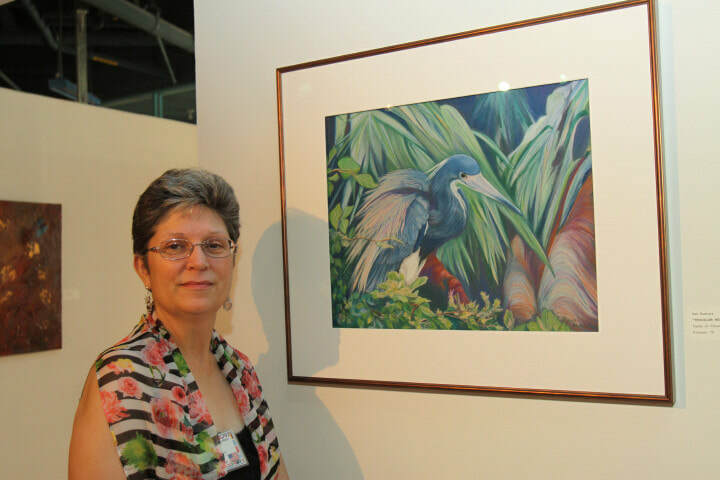 Natural history studies and volunteerism have always gone hand-in-hand with my art studies. This has led to several exhibitions of drawings, paintings, and photography in the Middle East, Australia, Venezuela, the US, and Europe, as a member of local and international groups. These groups included Women in Abu Dhabi, Friends of Creative Monochrome (photography), Doncaster-Templestowe Art Society (Australia), Galeria VAAUW (Caracas, Venezuela), Houston Women’s Caucus for Art, and most recently exhibitions associated with World Wide Art Promotions, as well as membership and exhibitions with MUSA International Art Space (Paris and Rome in 2017). PSST: Your series of nature paintings have reflected passages in the Psalms or the Parables of Christ. Beyond the scriptural reference, where do you find inspiration? Are you headed in a new direction or have you found new ways to carry forward the theme of your work? NELL BEDNARZ: So what is “Inspiration” if not a “fresh breath” that lifts the artist or viewer to a new level of awareness? For decades, I worked to show things I have learned about God and our place in the universe, everything tied to nature and my encounters with creatures around the globe. With time, I began doing portraits of my children, deeply inspired by their lives and the exploration that we have enjoyed together on different continents. In that respect, my Consider the Lilies series of floral paintings and the Love Thy Neighbor series of birds, butterflies, lizards, and other creatures that share this planet with us serve as daily reminders that there is much at stake for our treatment of this place. The complexity of natural life systems draws the viewer to a faith in something unseen. We cannot see gravity, but I see the effects, and this makes me want to explore the ripples of my own influence, and strive to be a blessing to others in what I create. I am inspired by the materials that I use, and by the principles behind caring and loving others as Jesus taught. The search to belong and to find a place for my work to help others will lead me further still. And now my greatest sense of success comes in how I can contribute to folks overcoming loss or creating pet portraits as reminders of the pure joy that such loved ones have brought to their families. NELL BEDNARZ: My favorite books tend to be about God, such as Imagine Heaven by John Burke. I find this type reading truly inspiring in a visual way. Favorite art instruction books: A Painter’s Guide to Design and Composition: 26 masters reveal their secrets by Margot Schulze. This is a great refresher about ways to create and compose for the intended message of my work. And Painting Abstracts: ideas, projects, and techniques by Rolina van Vliet. I find this great for seeing the “bones” of my paintings, for thinking through color choices, and it helps me think beyond the obvious in my art. I work both in realistic and abstract ways to express myself. Open Studio for my patrons and friends is being planned for the 2018 Holiday Season at my studio in Weston Lakes, Texas.